Tri-Village’s Derek Eyer goes in for an easy layup against Greenville on Saturday night. He finished with a game-high 23 points as the Patriots won the game, 73-57. Greenville’s Tyler Beyke tries for a layup against Tri-Village on Saturday night in a non-league battle. The Patriots won the game, 73-57. 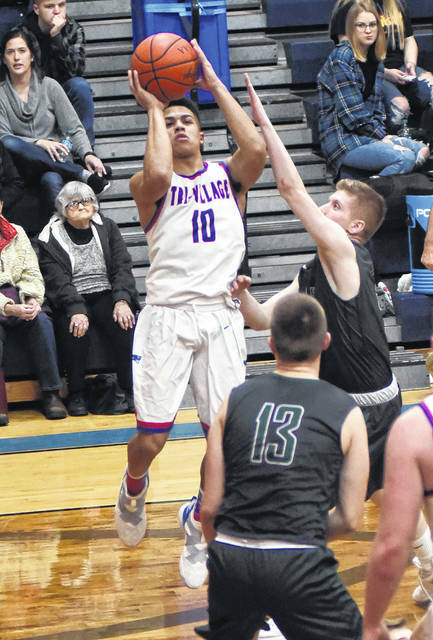 Greenville’s Noah Walker throws up a shot against Tri-Village on Saturday night in a non-league battle. 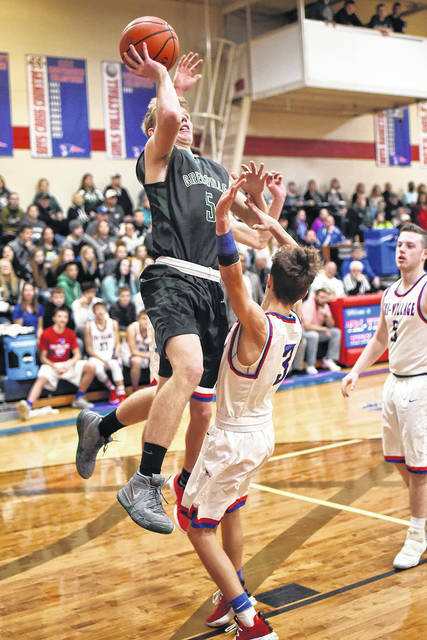 Walker led the Green Wave with 18 points, but the Patriots won the game, 73-57. 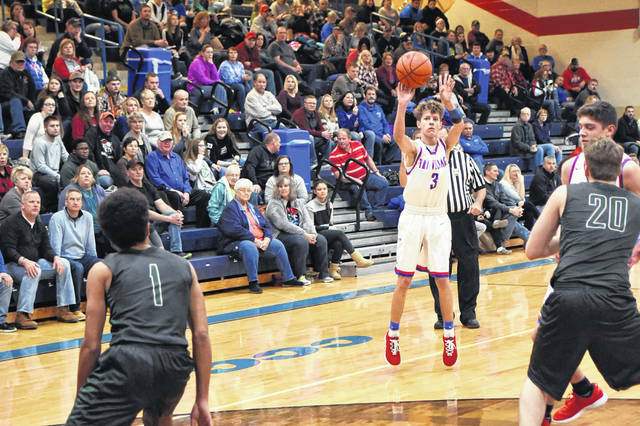 Greenville’s Nolan Curtis shoots a 3-pointer against Tri-Village in a non-league battle on Saturday night. The Patriots won the game, 73-57. Greenville’s Marcus Wood (1) and Tri-Village’s Derek Eyer (11) fight for a rebound during their non-league contest on Saturday night. The Patriots won the game, 73-57. The Greenville varsity cheerleaders pose for a picture during a non-league game at Tri-Village on Saturday night. The Patriots won the game, 73-57. The Tri-Village varsity cheerleaders during a break in the action of their non-league game against Greenville on Saturday night. The Patriots won the game, 73-57. 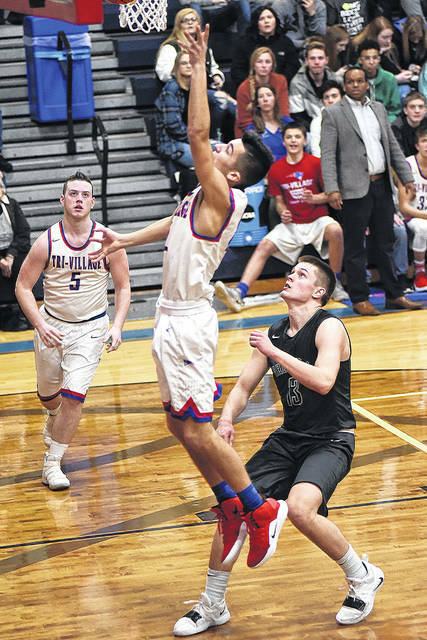 Greenville’s Alec Fletcher takes a jump shot from inside the paint during a non-league game at Tri-Village on Saturday night. The Patriots won the game, 73-57. 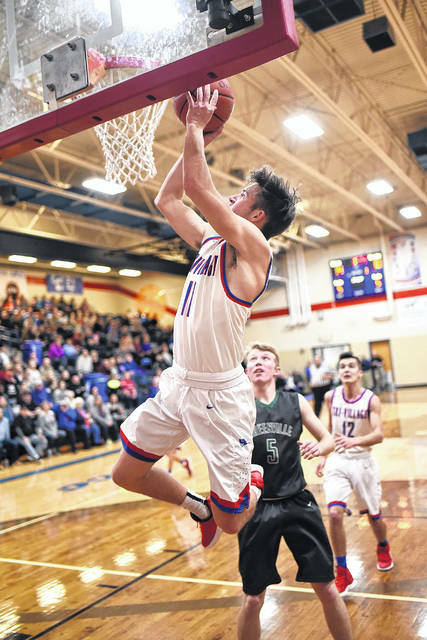 Tri-Village’s Austin Bruner takes a jump shot from inside the paint during a non-league game against Greenville on Saturday night. The Patriots won the game, 73-57. 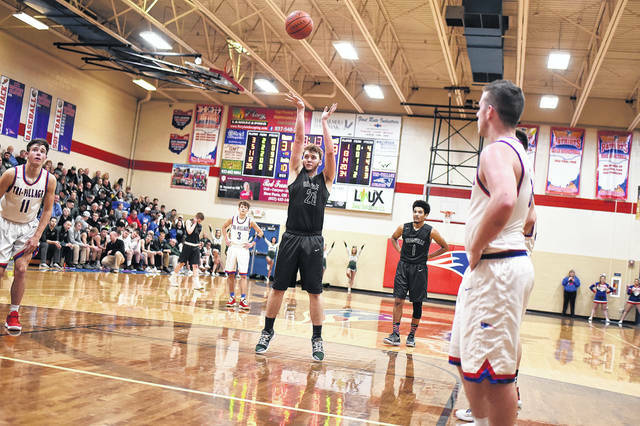 Greenville’s Foster Cole shoots a free throw during a non-league game at Tri-Village on Saturday night. The Patriots won the game, 73-57. Tri-Village’s Layne Sarver takes a shot from underneath the basket during a non-league game against Greenville on Saturday night. The Patriots won the game, 73-57. Tri-Village’s Mason Coby takes goes in for a layup during a non-league game against Greenville on Saturday night. The Patriots won the game, 73-57. 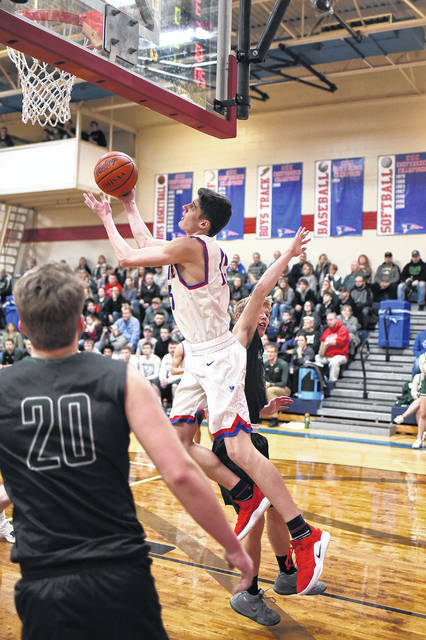 Tri-Village’s Gage Hileman shoots a 3-pointer from near the top of the key during a non-league game against Greenville on Saturday night. The Patriots won the game, 73-57. NEW MADISON – It was a full house at the Battleground with Greenville coming to town and when these two teams get together you can expect an intense game. In the end the Patriots were able to get to the rim and score easier baskets to earn a 73-57 win. 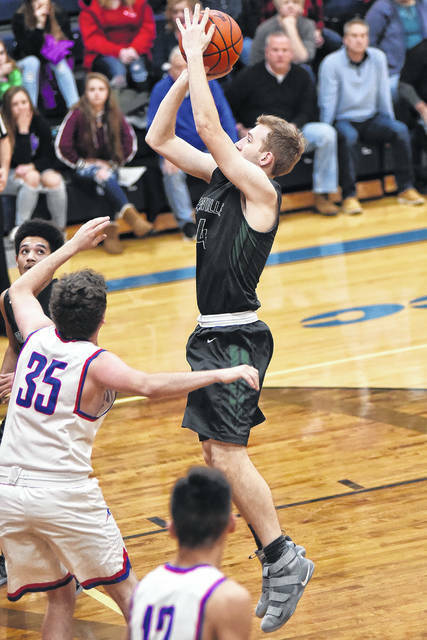 Greenville made 8 triples on the night, but the Patriots had 21 field goals and went 19-for-27 from the stripe to negate the outside scoring by the Wave. It was clear early on what Tri-Village wanted to do as they attacked the basket on multiple drives. Greenville wasn’t willing to concede the rim and found themselves in early foul trouble while trying to protect the basket. There were lots of hard fouls and bodies on the floor throughout the first half. TV jumped out to a 13-3 lead with Layne Sarver scoring 7 straight points and Derek Eyer sandwiching in 6 points. After a timeout by Greenville they finally found some rhythm offensively and outscored the Patriots 9-6 with Jordan Dill and Foster Cole scoring 4 points each, but the Patriots led 19-12 at the end of the period. 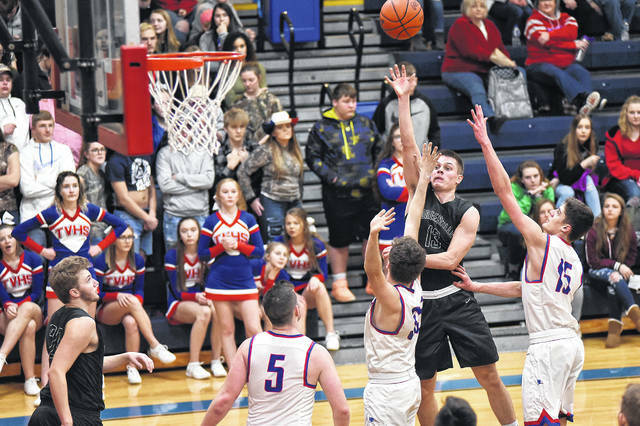 Greenville’s Marcus Wood hit a triple to close the gap to 19-15 before TV opened up another 12-point margin behind Gage Hileman, who had 9 points in the second quarter to go up 27-15 at the 4 minute mark. The Wave made another run by getting hot from behind the arch hitting 4 triples with Tyler Beyke, Cole and Nolan Curtis getting in on the act, but still trailed 37-28 at the half. “Something about when Greenville comes to town the atmosphere gets intense, it was electric but it’s fun, you have to like it,” TV coach MacKenzie Perry said. The intensity showed with nearly 30 fouls whistled in the first half. “We needed to make sure we just ran our sets and do what we needed to do, by focusing on ourselves without letting our emotions get in the way, and we did that for the most part,” Perry stated. The Patriots weren’t about to slow pace down in the third quarter as Eyer continued to attack the rim, good enough for 8 points along with Sarver knocking down short jumpers for 6 points to help the home team add to the lead 57-43. Noah Walker scored 7 and Wood 6 for Greenville in the third frame. 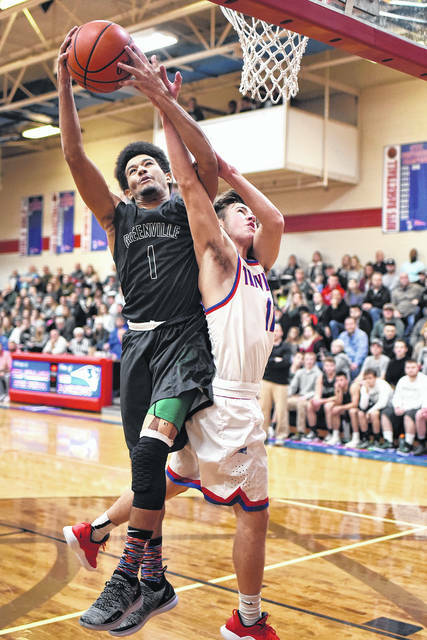 In the final stanza the Patriots took care of business by making their free throws going 8-for-9 while also getting 6 points from Mason Coby to close the door on Greenville to win it 73-57. 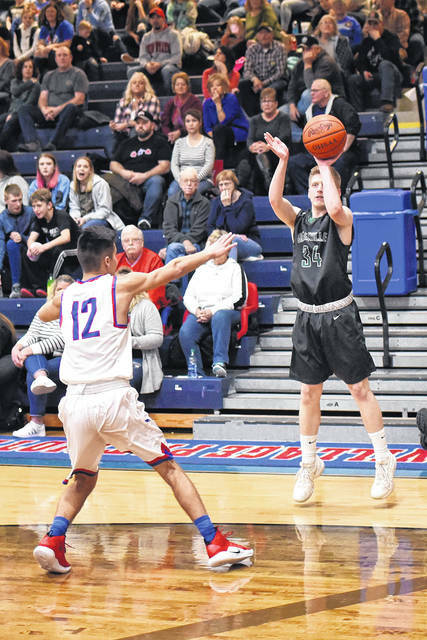 Perry was pleased with his senior guard play, “It was good to see both Derek Eyer and Gage Hileman both playing well at the same time, add in Layne Sarver scoring big and we become tough to stop.” Perry commented. He had words of praise for senior Mason Coby for his play as well. “We still haven’t put together a full game, but tonight I’m proud of our guys for keeping their composure and playing our game to get the win.” Perry concluded. Derek Eyer had a game-high of 23 points, Layne Sarver added 18 and Gage Hileman 14 to lead the Patriot attack. Noah Walker was high man for Greenville with 4 triples and 18 points and Marcus Wood added 14 for the Wave. Greenville coach Kyle Joseph was lost for words at the conclusion of the game, but noted his team was lacking in a few areas on the night. “Just right from the tip of the game, we didn’t have the discipline, the intensity and effort we expect. We didn’t manage our emotions very well, I tell them, we need to just focus on us, the guys on the floor and those on the bench to do what we need to do. We can’t worry about officiating or who our opponent is, and I think that hurt us a little tonight,” Joseph stated. Greenville will go on the road to play Tippecanoe Feb. 8and Tri-Village will be at home Tuesday night against Miami East for Senior night. Greenville – Marcus Wood 14, Tyler Beyke 5, Noah Walker 18, Jordan Dill 6, Foster Cole 4, Nolan Curtis 3.Totals 8-13-7/17 – 57. Tri-Village – Gage Hileman 18, Derek Eyer 16, Layne Sarver 12, Mason Lay 10, Mason Sullenbarger 6, Austin Bruner 4. Totals 4-21-19/27 – 73.